Photography has been an intermittent activity of late. It’s also been tricky this time of the year with writing tests, exams and grading, to get away with the camera. I’ve been more inclined to go just for a run or bike ride to clear the head. Nonetheless, Monday gave me the opportunity to do some photography around Devonport. One of the kids was going to be there for the evening, and I was operating the taxi-service. I had ruminated a return to Torpedo Bay or North head, but the sun had set by the time I was in Devonport. I thought I’d try my luck at Bayswater instead. I knew from previous visits that Bayswater gave a good view of the Auckland skyline across the Waitemata harbour. In it itself though, it was not that interesting. At least at night time. I’m sure the yachts and boats in say, early morning sunshine would be very nice to look at. At night time, the area is a little dull. My plan was to go with shots across the harbour toward Auckland. The gear therefore, was the Sony a7R with a 70-200mm f2.8 G. The tripod with a geared-head was mandatory. The shots I was going to take, had to be long exposure in such low light. This photo is actually 6 photos that I’ve stitched together later. Each photo was taken with the same setting (ISO200, 30 seconds, f13). The shots were all taken in portrait mode to increase the area covered by the panorama. I anchored the left side of the image on the War Memorial Museum in the Auckland Domain. It extends to the Viaduct basin. The final image is a 2.5:1 ratio panorama. Albeit a judicious crop at the bottom could make it a 3:1. As it stands, it’s a nice 115 MP photo. What really worked that night was the cold temperatures brought on by the southerly. The air was cold, crisp and very clear. While you can’t see it in this picture, once the photo is close to a 100% view, even the Cenotaph in front of the museum is in view. The amount of detail captured is extraordinary. A slightly larger version of the photo is available for viewing here. The other thing that worked well here was the tripod. By lining up each shot precisely and exactly, the stitching program had no difficulty aligning the different photos. 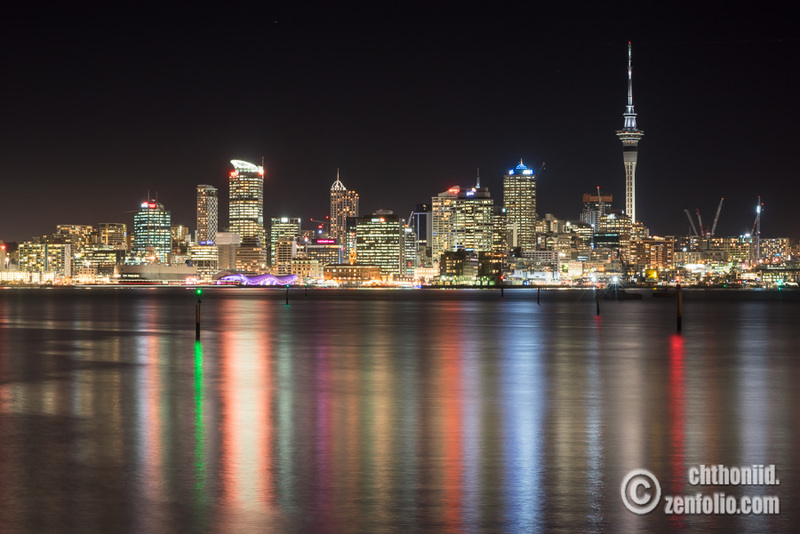 If you need a print of Auckland that is say, 6 feet across, then look no further! The photo has been uploaded to my online galleries also.